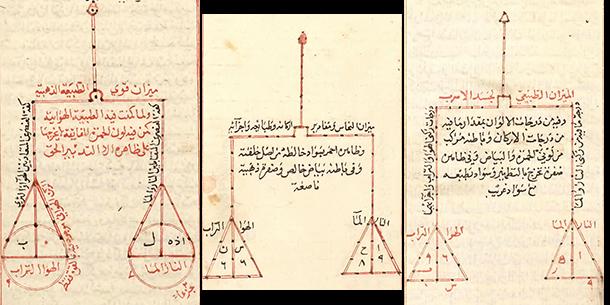 "This manuscript is an invaluable source for understanding alchemical doctrines and practices in the Islamic world during the Middle Ages. Its author, the polymath Mu‛ayyad al-Dīn al-Tuġrā’ī, was born in 1062 AD in Persia (present-day Iran) and worked as a secretary in the Seljuk court. He later was appointed vizier in Mosul (present-day Iraq), but his career came to a dramatic end in 1121, when, following the disgrace of his protector, he was falsely accused of heresy and beheaded. 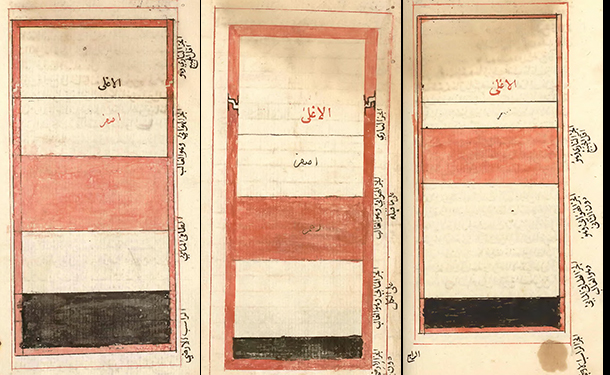 Notes on al-Tuġrā’ī’s biography were added to the first page of this manuscript at a later date, together with some marginalia intended to correct, highlight, or comment upon particular passages of the treatise. Kitāb mafātīh ar-rahma wa-asrār al-hikma (The keys of mercy and the secrets of wisdom) consists of two parts. 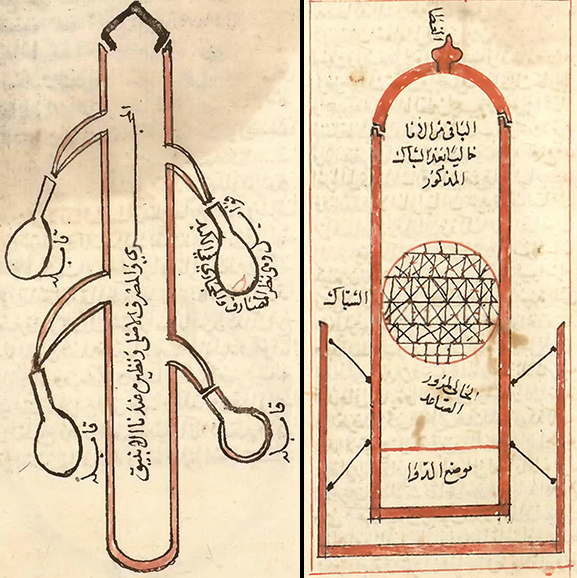 The first half of the treatise is a muqaddima (long introduction), in which the author presents a systematic exposition of alchemical doctrines, from the theory of the four elements to the preparation of a white elixir for the transmutation of copper into silver and of a red elixir for the transmutation of silver into gold. 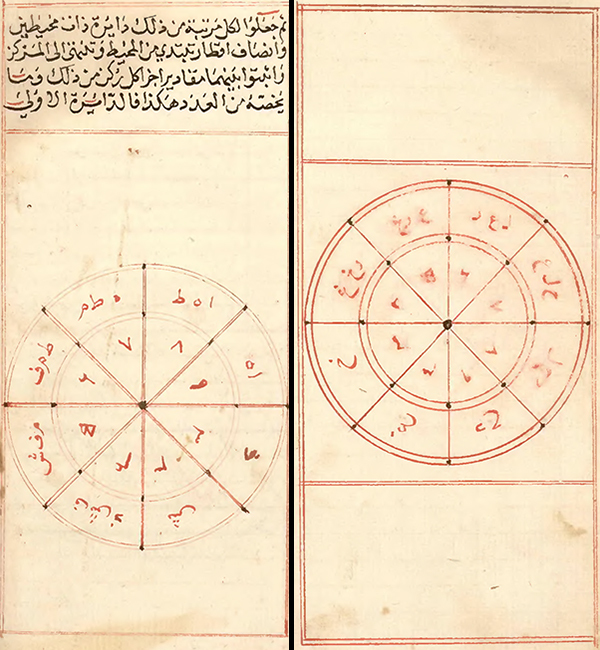 The second part of the manuscript contains al-Tuġrā’ī’s Arabic translation of a Greek treatise by the famous alchemist Zosimus of Panopolys, who flourished around 300 AD. Al-Tuġrā’ī interpolates the text with his own comments and with quotations from other authorities (including philosophers such as Artistotle, Democritus, and Galen and mythical or historical characters such as Hermes and Cleopatra) to the extent that it is difficult to identify much of the original Greek work. Nonetheless, the very existence of this translation says much about role of Arabic sciences in the preservation and transmission of ancient and Hellenistic scientific knowledge. 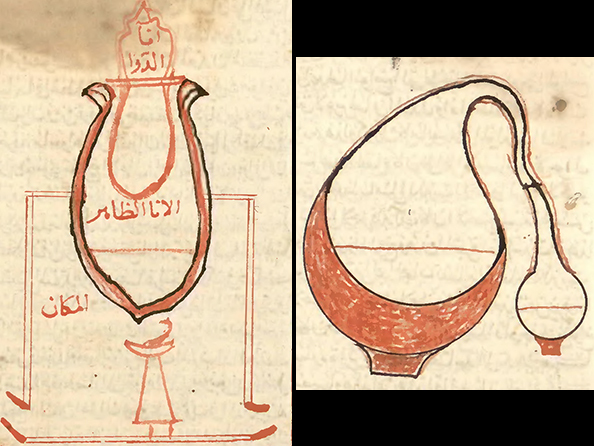 The manuscript is embellished with numerous drawings of chemical apparatuses, including vessels for distillation and sublimation and different kinds of furnaces, and tables intended to explain the theoretical contents of the text." So it's not as exciting as if it was from the 12th century, it's still a later copy of a much older work. 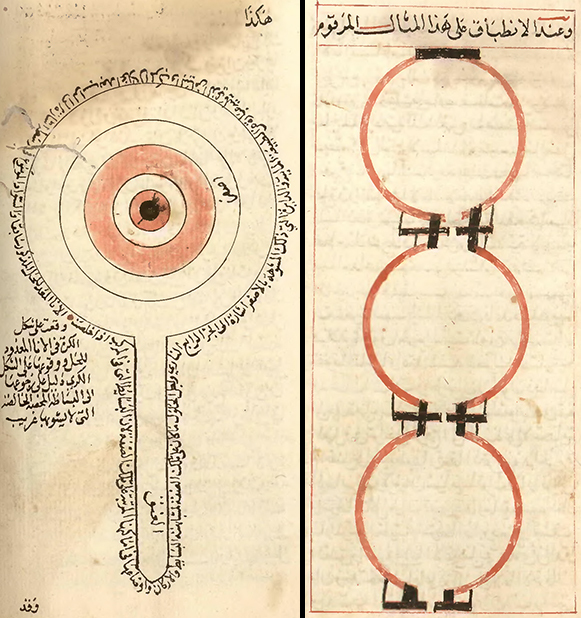 In 'my experience', most arabic texts often don't have any images (with astronomical texts being the exception). 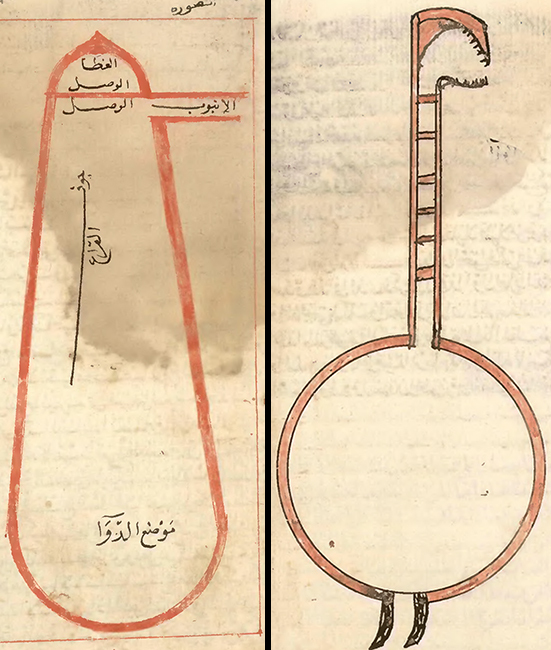 This is maybe the first islamic text on alchemy I've seen with any (although I've seen quite a few without any images). 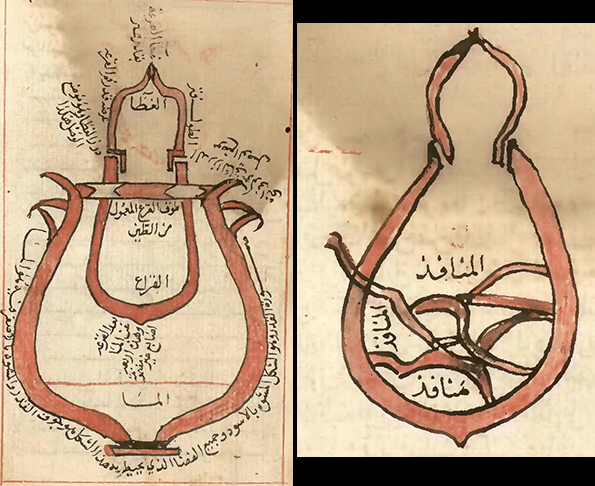 Wikipedia has this as "The Lanterns of Wisdom and the Keys of Mercy" and claims it is one of the earliest works of material sciences. I've also seen it referred to as "The Lamps and the Keys". This is not everything that's in there, there are other diagrams and many charts that I haven't included. "O Man, that art so full of information penetrating into secrets; listen, for in silence is safety from slips-'They have fostered thee for a purpose, did thou but understand it. Have a care to thyself, lest thou feed with lost sheep."